I'm In Love with these Brownies. Four batches in three days in love. I didn't invent black bean brownies, but I did modify the recipe to make it gluten free, dairy free and sugar-free. So these are Candida-diet friendly. Oh yeah! I generally don't eat legumes. But small portions are allowed on the Candida diet (and most low carbohydrate diets) because they are so low in net carbohydrates and have no sugar. Don't eat the whole pan but a couple of servings can help to keep you satisfied and ready to keep taking on that sugar beast trying to get back into your life. I used Xylitol for a bit of sweetness. If you aren't on the Candida diet you could probably substitute maple syrup or agave. Or increase the amount of Xylitol if you want it a bit sweeter. I'm trying to restrict my sugar and sugar alcohols as much as possible so I keep them to a minimum. My mind is still blown that such a simple recipe made out of a a can of beans can taste this good. They really are amazing. And I've tried lots of weird and wonderful combinations of foods in my quest for clean, low-carb fare. So I'm not that easily impressed. But these impressed me. Give them a try. Even my kids liked them. Mix all ingredients, except nuts, together in mixing bowl, blender or food processor. If you are doing it in a bowl use an immersion blender to combine ingredients until beans are fully pureed. Add nuts (except 1 Tbsp) and gently fold in. Separate mixture into 12 lined muffin tins. Top with left over nuts. If you aren't on the Candida diet you can add a few 70% dark chocolate chips (optional). Bake for about 22 minutes or until knife in center comes out clean. FOR THE LOVE OF ALL THAT'S HOLY!!!! I just made my first batch. It was all I could do to stop eating the batter so some would make it to the oven. I was HUGELY skeptical. You now have a VERY EXCITED CONVERT on your hands. Absolutely amazing!!!!!!!! I love your enthusiasm for food.......I share it. And this recipe definitely deserves the excitement. It's kind of unbelievable when it actually works. I'm just defrosting one of these for a snack.............yummy! Any idea how much Stevia could be used? I'm not 100% for liquid Stevia - maybe 1/4 tsp. I have generally started using Truvia as a sugar replacement - its a powdered mixture of Stevia and Erythritol. I would use 2 or 3 Tbsp depending on how much sweetness you are looking for. I am finding liquid Stevia doesn't work as well with baking as powderered but I have done it as well and it will work in a pinch. Good luck! Any idea what the nutrition facts are for these? They look delicious! Can't wait to try! Unfortunately, mine did not turn out well either. The only difference I used in my recipe was 4 TBSP of Stevia powder instead of Xylitol. Mine tasted, well exactly like I would imagine dirt would tast and not sweet at all. :( I hate that these didn't turn out. They look so good. Sorry they didn't work out for you. So many factors can affect baking - ingredients, altitude, etc. 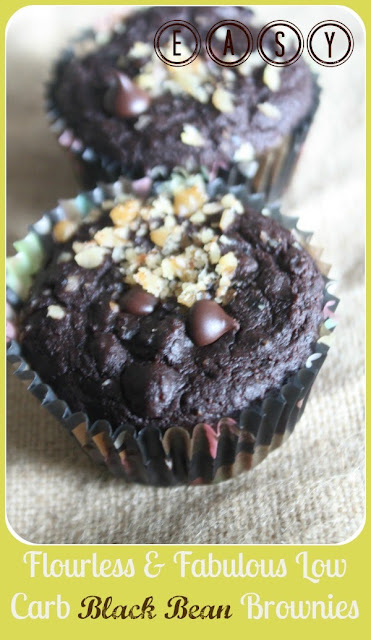 I've made these a few times and they have always turned out.........that being said I was on a NO-sugar diet at the time so maybe my palate for sweets was super sensitive. Good luck on your journey to finding "sweet" clean recipes - there are all sorts out there. Anyone know the carb count on these? Hi! I am just learning to eat clean and am struggling with sugars/carbs which I shouldn't have. This looks like a great recipe. A couple of questions: 1. Someone mentioned using 4 TBSP of Stevia powder. Is this correct? I currently use 1/4 of an 1/8 tsp. to sweeten my coffee and much more than that is extreme. 2. Can I use non-canned black beans that have been soaked, cooked, and cooled? What would be a safe measurement to use? 3. I am currently using CapTri MCT oil made from fractionated coconut, although it has no flavor. Would it be okay to use this, or do you recommend still using regular coconut oil? Thanks so much for your advice!!! Stevia is much stronger than xylitol and most other sweeteners, so I would recommend using less. I'm not sure what the perfect conversion would be, I only used 1 tsp and added some maple syrup, but mine weren't extremely sweet. I would say maybe 3-4 tsp of stevia would substitute nicely. I plugged in the ingredients on myfitnesspal.com's nutrition calculator, omitting the walnuts and using Stevia in the Raw in place of Xylitol.. Nutrition facts for 12 brownies (w/o walnuts): Calories:80, Carbs:7g, Fat:5g, Protein:4g, Sodium:287mg, Sugar:1g. With 1/2 cup chopped walnuts: Calories:110, Carbs:8g, Fat:8g, Protein:4g, Sodium:287mg, Sugar:1g. .
is that per one brownie? I'm wanting to boost the protein content in these. Has anyone ever tried adding a scoop or two of protein powder to the batter? I'm curious how they would turn out. Thanks for sharing this recipe, these are really good! I have been looking for a healthier chocolate recipe, and these turned out very light, fluffy and fantastic. I used 2 tbsp maple syrup + 1 tsp stevia in place of the xylitol. They were just mildly sweet, which is my preference. I also used cacao rather than cocoa and they still turned out very chocolatey. The recipe was good, I found it a little dry for brownies and I used 2tbsp of brown sugar truvia, I'm going to add coconut oil to the next batch and an extra tbsp of truvia. Good for chocolate cravings!